For some time, Advisian INTECSEA has had the skills to broaden its support to the UKCS. We have strong engineering and analytical capability which allows us to deliver a full lifecycle service to customers around the world, but rarely have we dipped our toe into the choppy waters of the North Sea. 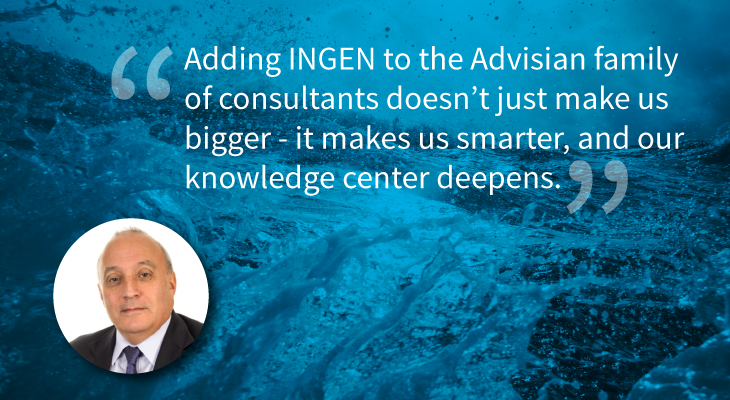 But now Ingen is part of the Advisian consulting family, and we think our offering is even more powerful when coupled with their proven UKCS experience and impressive track record. Combining our technical expertise with Ingen’s established field development and subsea projects capability enables us to offer our unique set of skills and provide greater technology agnostic competition. Combining technical expertise results in individual consultants equipped with lessons learned from the previous experience of both companies. We're not just bigger - we're smarter, and our knowledge center deepens. We believe we have a unique opportunity to support our customers through value adding developments and extending the life of existing subsea facilities. Together we now offer engineering consultancy services with expertise in rigid and dynamic riser-sand pipelines, umbilical’s and controls, flow assurance, structures, asset integrity and advanced analysis. In the UK we’ve now got a combined team of over 250 experts delivering concept engineering, feasibility studies, FEED and detailed design, project management and owners engineering, operations support, life extension and decommissioning studies for our customers. That means whatever our customer’s problem or project, we’ve got an expert who will have the experience, the specialist skills, the solution. Contact me or my colleague Steve Rolfe at Ingen to find out more. Ingen is at www.ingen-ideas.com or on LinkedIn. Field development planning - what’s the value?